As I described in my July column, the first motorized-vehicle race on land is acknowledged by historians to be the 1893 Paris to Rouen. Other place-to-place races followed in Europe before the turn of the century. Many of them involved Paris as a location of origination or destination. Paris-Bordeaux-Paris followed Rouen in 1895, Paris-Marseille-Paris in 1896 and so on. The original purpose of these events was to demonstrate the viability of motorcars as a means of transportation. The first in the U.S. was the 1895 Chicago-Waukegan-Chicago. By 1907, the longest race to that date was from Peking to Paris. The ultimate of the genre, however, was the New York-to-Paris in 1908. Wait a minute! How could there be such an automobile race when there’s the Atlantic Ocean between the two cities? Well, it depends on which way you go. To the West, there’s only the 53-mile Bering Strait separating the United States from Russia. The rest is land. When the race was announced, the original course was planned to include a 150-mile ship passage from Nome, Alaska across the Bering Strait to East Cape, Siberia. (As an aside, it is actually possible to make the trip solely via a road-going vehicle, because the Strait freezes over in the winter. But it wasn’t until 2008 that Steve Burgess and Dan Evans made the crossing in a Land Rover Defender 110). 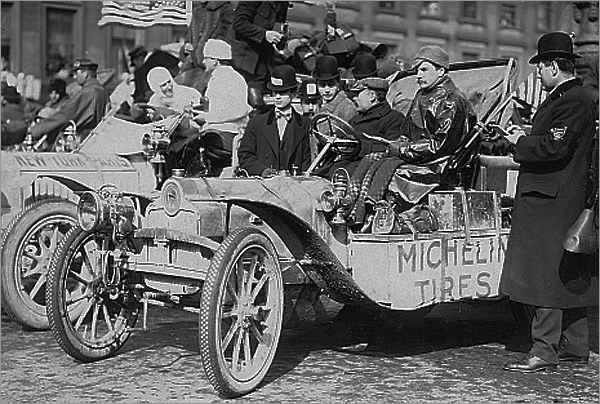 In 1908, the idea of driving a car from New York to Paris was not credible; it had never been done or even attempted. Paved highways in those days were almost unknown and, in some parts of the course, there were no roads at all. Road maps were non-existent. The cars themselves were fragile as were the tires. Not only that, the race took place during the winter! The eventual route was New York City to Albany, Chicago, San Francisco, Seattle, Valdez, Japan, Vladivostok, Omsk, Moscow, St. Petersburg, Berlin and Paris. The race was sponsored by the New York Times and Le Matin, a Paris newspaper. It was described as “the most fantastic, grueling, strenuous test ever devised for man and machine.” Six cars entered: the U.S.-built Thomas Flyer, an Italian Züst, a German Protos plus a French DeDion-Bouton, Motobloc and Sizaire-Naudin. 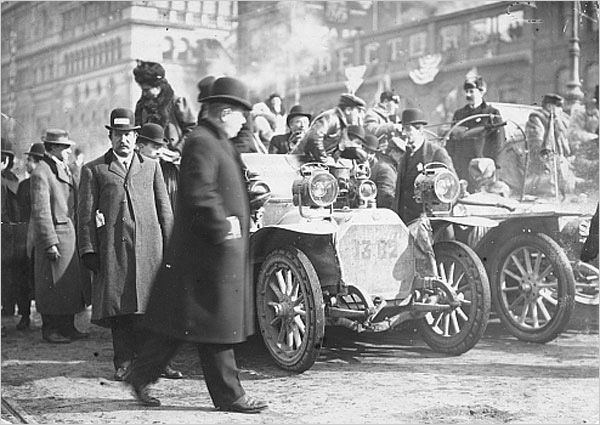 American race driver Montague Roberts drove the Thomas with George Schuster the head mechanic. Kaiser Wilhelm selected Lt. Hans Koeppen to drive his personal entry, the Protos. Baron Charles Godard, headed the Motobloc crew. Marquis DeDion chose G. Bourcier de St. Chaffrey. The crew-captain driver of the Sizaire-Naudin was M. August Pons and Antonio Scarfoglio drove the Züst. All of the cars were loaded with extra gasoline, shovels, ropes, chains, tools and spare parts as well as the drivers and crew. The American Thomas Flyer with Montague Roberts, captain and river, George Schuster, mechanic and New York Times Correspondent Walter Williams aboard. 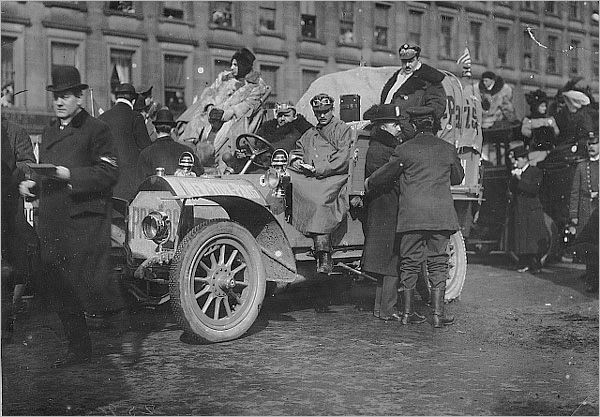 The Italian Zust with Giulion Sirtori, driver, and mechanic Herni Haaga and correspondent Antonio Scarfoglio aboard. The French Sizaire-Naudin with Auguste Pons, captain and driver, mechanics Maurice Berthe and Lucien Deschamps aboard. The German Protos with Lt. Hans Koeppen, captain, Hans Knape, driver, and Ernest Mass, mechanic aboard. The French DeDion-Bouton with Bourcier de St. Chaffrey, driver, mechanics Alphonse Autran and Hans Hendrik Hansen aboard. The French Motobloc with Baron Charles Goddard, captain and river, Arthur Hul and Maurice Goddard, mechanics aboard. As a “dumm” European national I was always told that the Peking-Paris of 1907 was the Greatest Race ! There is even a famous book by that title ref. that race ! Why am I writing you this ? Because Ettore Guizzardi, Prince Borgheses Itala driver was born in the Municipality of Budrio near Bologna, Italy, my hometown, just like Franco Zagari (the automotive historian and writer/photographer), as well as Alessandro Zanardi and Giancarlo Martini (both Formula 1 drivers) and lets not forget Tarquino Provini (motorcycle racing great). So for me the Greatest Race is Peking =Paris won by Prince Borghese and his crew on an Itala ! 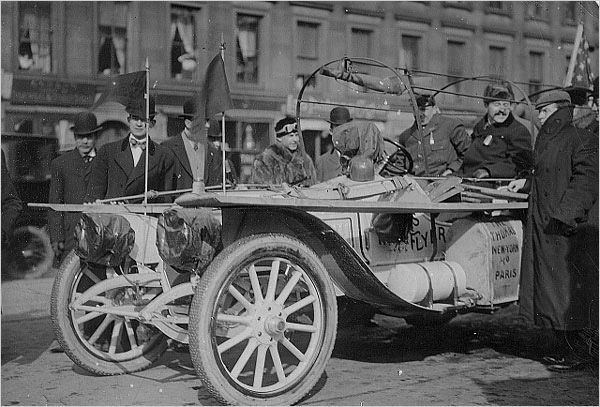 Great article about “The Great Race of 1908” and wonderful archival photos! It still amazes me about the size of the crowds that flocked to events like these in the early 1900s. Given the challenges that the racers faced, these were truly heroic times in the history of the automobile! Just a slight clarification to an otherwise good story. When he left the race in the lead in Wyoming, Thomas Flyer Driver Montague Roberts did not have a “legal problem” per se. He had a commitment and contract (so I guess it’s “legal”) to drive in another race. I believe it was either the French Grand Prix or the Vanderbilt Cup. I think it was the French race because as I recall in reading Julie Fenster’s fine book, “Race of the Century” she states that his “steamer was awaiting” back in NY. He put the wheel in the trusted hands of his hand picked mechanic, George Schuster. There are more pictures on the site I’ve listed above and below. Great story. I can see how an American car, built to handle our vast spaces and frontier conditions could be competitive. Too bad the race isn’t repeated today. Maybe it’s something American “engineering” could compete in. We seem to specialize in pick-up trucks this century, having specialized in station wagons and SUVs last century. Surely Paris-Rouen was 1894, and not 1893 – or has a new landmark event come to light? Great story, but I thought you could have mentioned that the Zust did eventually make it to Paris. Also a mention that a restored Zust purported to be the N.Y. to Paris vehicle would have been informative, even if you personally do not believe in it’s authenticity. … (The available info does appear to support the claim). It is a great adventure and auto story and that is why we made http://www.thegreatestautorace.com film. It is very accurate using many of the 1000s of original photos we found in attics and closets from around the world. We built full size running replicas of the Thomas and Protos and a partial Zust. They were recently the “stars” at the concours in Thankgivings Point Utah. It has won numerous awards including the EP Ingersoll Award from the Society of Automotive Historians. Congratulations on a well crafted article! Even with the many automotive advancements of the past century, I can tell you retracing my Great Grandfather’s (George Schuster) route 103 years later was not an easy task. We began in Times Square April 14, and arrived at the Eiffel Tower on July 21, 2011. 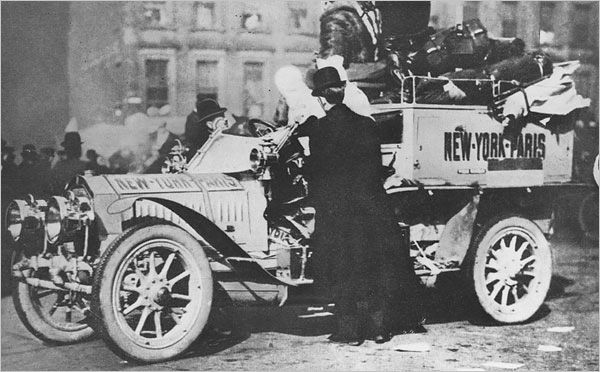 The courage and ingenuity of not only the winning US Thomas Flyer Team, but the efforts of the German Protos and Italian Zust makes the 22,000 mile epic 1908 New York to Paris Race the greatest automotive competition in history. In recognition of his historic achievement, George Schuster was inducted into the Automotive Hall of Fame on October 12,2010. The photo captioned “The Thomas Flyer was loaded aboard a ship for the trip to Japan.” was taken on the dock in Valdez, after the Thomas Flyer arrived there. 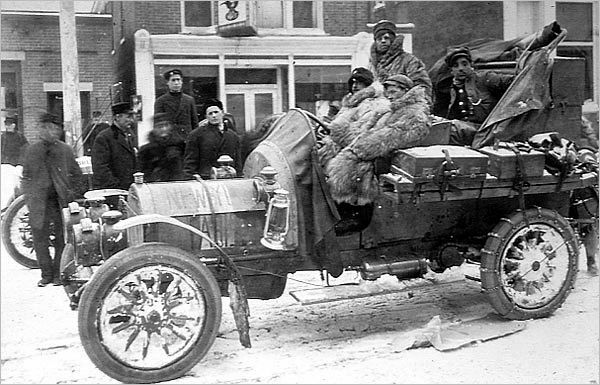 It was the only car in the race to make it to Alaska. After realizing that it would be impossible to drive beyond the dock due to deep snow, the Flyer returned to Seattle and THEN sailed to Japan. None of the cars went to Japan by way of Alaska. The handicap given to the Flyer for this extraneous trip explains how the Americans won the race, even though the Protos arrived in Paris first. My great uncle, Montague Roberts, drove the first leg of the race in the winning Thomas Flyer.